Evan Trychta scored twice for the Lakers in the win against Holy Cross. Now is when the real job begins. 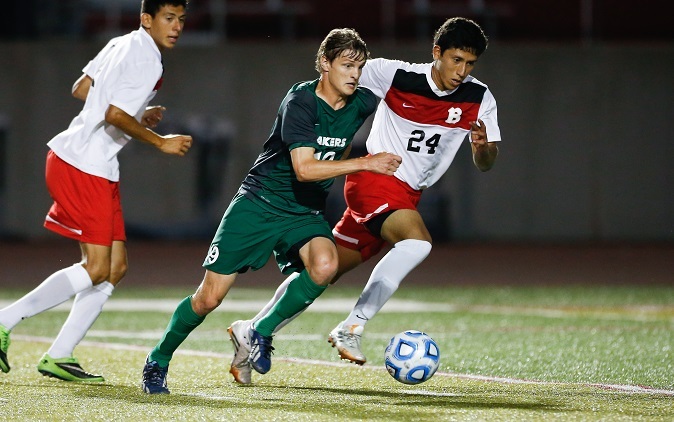 After beginning their season playing six games against teams that are not in their conference, Roosevelt’s Men’s Soccer team is now ready to start playing rivals that are within their own conference and start competing for a spot in the postseason. So far, there have been many ups and downs for the team this season. They went 2-3-1 over the course of the six non-conference games, but Head Coach Graham Brennan does not necessarily see this as an indication for how the team will do against their conference rivals. Senior defender Hayden Hagemann gave his own insight on how the season is going so far. “It’s been up and down so far, we’ve played some really good teams,” he said. He also cited a recent overtime win against Grace that came off of a goal by Luis Ortiz with 47 seconds left in the game. “Hopefully that should give us some momentum,” Hagemann added. According to Coach Brennan, a good amount of players on the team commute to school and he said that can affect their playing on the field as well as the amount of energy they have to give at practices. “One of the bigger challenges this year is the overall workload that’s put on the players, some guys commuting 30 minutes, some an hour, the biggest thing is how well as a group and individually everyone balances their time to their different commitments,” Brennan said. Additionally, Hagemann says the team realizes how important it is for success overall that they learn to work together through the tough times. These next few weeks, Brennan says, is really going to show him and the rest of the team where they are and how the rest of the season may go. “As we continue to figure ourselves out and the dynamics and best attributes of the group how to improve on those and continuing that growth process” he said. So far, one of the best moments of the season for Hagemann was the team’s trip to California. “We played two tough teams and being able to hang out at the beach with the whole team was a lot of fun,” he said. According to the university’s website, the team won its first conference game of the season to St. Ambrose. They also picked up a win against Holy Cross.